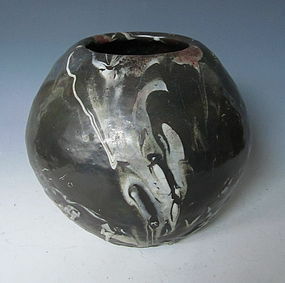 A round studio ware vase done on a black base glaze with white covering areas of the vase with a bit swirled with black. The vase contains a signature that appears to read: Kotaro. Age: Late 20th century. Size: height 6.5" diameter 7"
A set of five ceramic tea cups with box used to serve sencha produced by Otagaki Rengetsu (1791-1875). 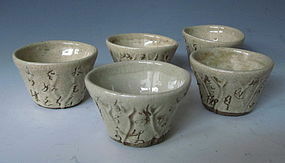 The cups are in the form of lotus leaves and the exterior of the cups contain an inscription by Rengetsu, which generally translates: The willows, not in its disarrayed form, the branches not touching, yet branching out into the world. Age: Late 19th century. Size: diameter 2.3" height 1.5"
Large crater bowl, thinly potted of black clay and with green glaze pitted with craters for volcanic effect, Signed Lovera; Jamese Lovera (American, b. 1920) modernist potter. 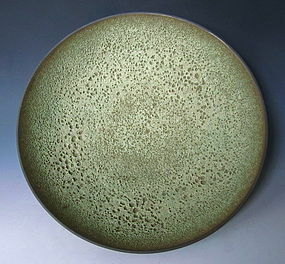 James Lovera exhibited at the Crocker Museum in Sacramento in 2006: "Craters of Fire: Ceramics by James Lovera". Japanese vase with a scenes of seven sparrows flying among crysenthemums in beautiful hues of purple, orange, green, blues and yellows. 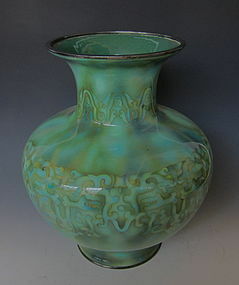 Vase contains a signature on the bottom with the name, Kinkosan. Some old repairs. Age: Meiji period. Size: Height: 12" Diameter: 8"
Antique Japanese cloisonne vase with a Chinese archaic style decoration of dragons and other stylized animals on a variegated green ground. There are two decorative bands, one around the neck and one around the body. Silver mark and Ando mark on bottom. It measures 12" tall the base is 5" wide the mouth is 7" wide. Original wooden box (tomobako). 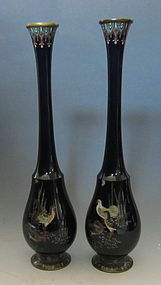 Pair of dark blue cloisonne vases with scenes of birds among reeds. 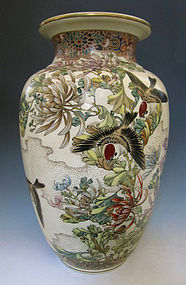 The base and mouth of the vases are bordered with an intricate design. The backs of the vases have a simple depiction of reeds with grasses. They measure 1.75" wide at base 11" tall. The bases are both signed with the same signature. Meiji period, 1868-1912. 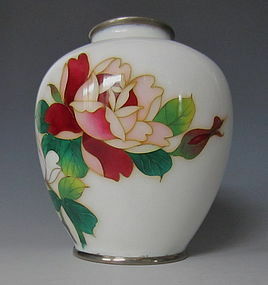 Japanese cloisonne small vase with blooming roses. There is a fully bloomed red rose and a small budding red rose. Along the base, there is a blooming white rose with pink edged petals. 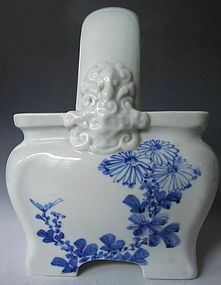 The body of the vase is a cool white. Taisho period, early 20th century. It measures 1.75" base diameter, 4" widest, 5" tall. Good condition.